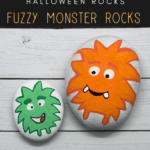 Fuzzy Monster Rock Painting that your Kids will Love! 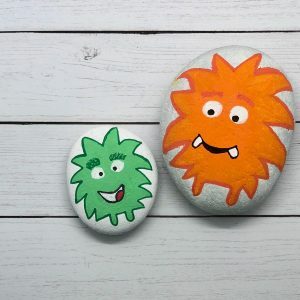 Fuzzy Monster Rock Painting Idea that your Kids will Love! Here’s an easy and beginner-friendly fuzzy monster rock painting tutorial. Monsters don’t have to be scary. Make these silly monsters for your next Halloween craft project. 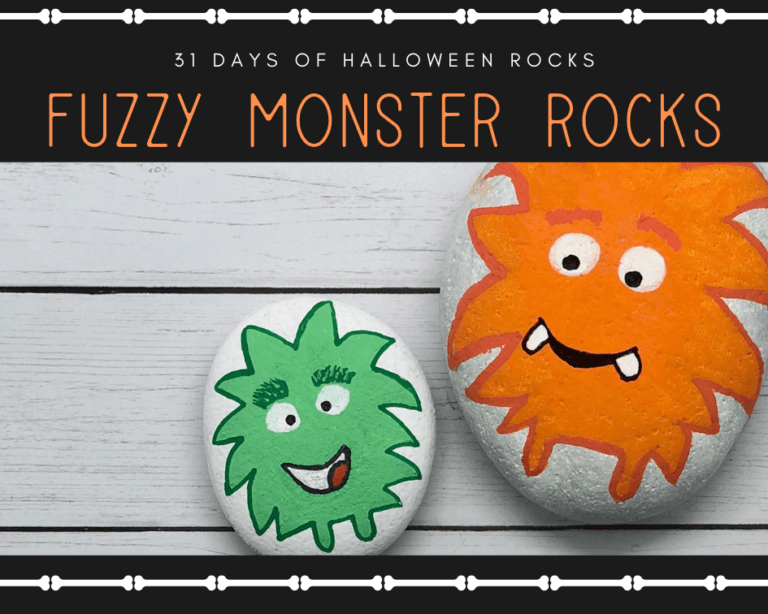 This spooky rock painting craft is a part of another post called, 31 Days of Halloween Rocks, check it out for more boo-tiful rock painting ideas. 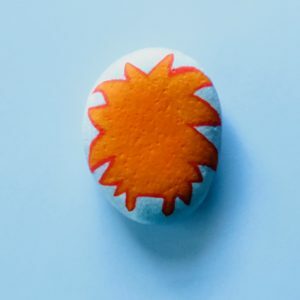 If you’re new to rock painting, go to Start Here to get all the beginner rock painting tips and find out the best tools and supplies to use! Start by searching in your own backyard for rocks to paint. Public areas such as parks and hiking trails are great places to find rocks. It’s against the law to remove rocks or even leave your painted rocks in National or State Parks. You can even try home improvement stores, a local garden center, or stone yard to purchase your rocks. Next, it’s time to clean the rocks using soapy water to remove dust or dirt. Let them dry completely before starting the project. Apply a coat of white craft paint. Let it dry completely before moving on. Draw your fuzzy monster with a lighter shade paint pen and fill the area. I used a darker and lighter orange and green for my fuzzy monster rock painting. Use the darker shade paint pen color to outline the edge of your monster. Now, make your fuzzy monster as cute as you want! Let your fuzzy monster rock painting dry completely before spraying with a clear sealer. Acrylic paint is water-based, fast-drying paint, but it’s also easy to clean off of skin. Read 25 Hacks Every Artist Should Know for clothing stain removal tips. Follow the directions on the clear sealer spray and be sure to use in a well-ventilated area such as outside. Have you made your own Fuzzy Monster Rock Painting? If so, let me know in the comments below. Also, share your rock art in Rock Painting Guide’s Facebook Group page, here or at the top of the page in the Community section. There you can post your rock painting questions, give advice on rock painting, share your rock art, and join the fun with our amazing rock painters beginners and pros!